The mobile version of Google Docs, available at http://docs.google.com/m, displays the list of documents and almost lets you view them. The interface is somewhere between the iGoogle gadget and the desktop interface. It's pretty easy to find documents by using search, going to a folder or looking in the list of recent documents. But once you find the file, you won't be able to do too much. For most phones, you can read documents and view spreadsheets a column at a time. If you have an iPhone, your experience will be better: spreadsheets can be fully displayed and presentations can be opened. "At this point, we support both the iPhone and Blackberry mobile devices. Note, however, that presentations are only supported on the iPhone. Google Docs documents and spreadsheets should also work on phones that offer rich-browser support. While we haven't tested it across all mobile devices, a good rule of thumb is that the more advanced your phone's browsing capabilities, the more seamlessly Google Docs will work," mentions a note from the help center. Maybe Google should release a mobile application that actually lets you edit the documents. I don't know why I would want to write an article on my phone. With more and more functions on the phone, there are more distractions. It depends. Maybe you're using Google Docs to write a book or just some notes for a project and you realized that something needs to be added, but you don't have a computer around. You could write the notes on a piece of paper or using an application from your phone, but then you'll have to remember to add them to Google Docs. 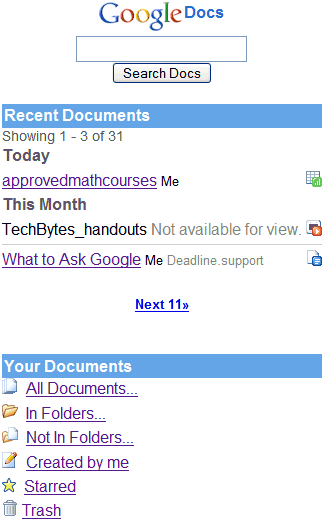 Besides, one of the main promises of Google Docs is "access and edit from anywhere". Definitely - while some users don't have a need for this, they also aren't being forced to use the Internet aspect of their phones - or indeed to buy phones that have Web access at all. Not to be rude, but the statement "With more and more functions on the phone, there are more distractions" is a bit like saying there are too many websites on the Internet, and now you get distracted when trying to go to Netscape.com. The experience on the iPhone is so much closer to that on the Web, though the inability to edit or create docs is a true disappointment. One of the main reasons I bought my iPhone is because I'm a very mobile Web designer, that is, I'm a freelancer, I work out of coffee shops and have meetings all over the city, so I spend a good bit of time riding buses or waiting for people to arrive. Being able to do as much work as possible on my phone while in transit is great, that way I can feel free to get around the city and not waste time. Google has a mobile personalized homepage, but it seems to be restricted to the US. Anyway, go to Google's mobile homepage ( google.com/m ) and click on iGoogle. It should send you to this page. Does it allow to edit, I tried this in my mobile Treo 650, doesn't allow edit, only view the documents. If it allows only viewing then it will be the same as Zoho, which allows viewing oly. The iPhone is one of the most advanced mobile devices avalible. Please get google docs up and running with editing soon! It would be a huge advantage to ne able to edit my docs on my iPhone. I use this and it is great! I keep a spreadsheet of the times and hours that I work for different clients. Each day on the train home I update the hours. My brother in law is a land lord for several student flats. He uses Google mobile docs to see who has and has not payed via spreadsheet. I have Nokia E61i with "qwery" keyboard and I really want to edit spreadsheets from my smartphone. I'll be very happy when I have this "edit feature" done for my phone.